I’m Giving Away 100 Copies of My Popular Writing Guide! 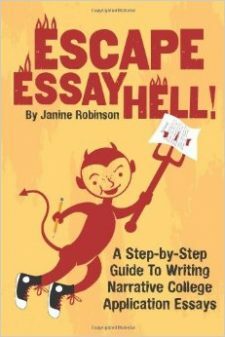 Almost every day, I have students tell me they cannot afford to buy my ebook guide on writing college applications essays–Escape Essay Hell!--so I decided to give some away for free. I want as many students as possible to find help writing these dreaded essays, and I understand that ten bucks can be a lot for some people. That’s the main reason I started my blog! So, starting tomorrow (Thursday, September 19, 2013), I am going to give away 10 copies a day to the first students who send me an email request–and I will send 10 copies a day for a total of 10 days. That means I will be giving away 100 copies total. So if you are interested, send me an email at this address: EssayHell@Gmail.com. In the email you must give me your name, the name of your high school or college, and that you would like a free copy. That’s it! I will send you a copy of my ebook that you can download and read. I am going to go on a first-come, first-serve basis. I will let you know once I have reached 100 winners–so you won’t waste your time.